Mention 'Death to the Daleks' to any fan and there's a good chance what pops into their mind's eye is a headless Dalek with a plume of flame licking up its back. There are actually half a dozen or more slightly different shots of that scene -- it must be one of the most photographed moments in Who history -- but the image is iconic to this story, surpassed perhaps only by Roy Knipe's dramatic rendition of the same idea for the Target book (as paid homage to by Lee Binding on the DVD sleeve). Often I'll go against the familiarity of such images and try to come up with something different for my covers, but in this case it just seemed the right way to go, and fits with the title well. In the event it got a bit more complicated than I anticipated. So the plan was to have the burning Dalek centre stage, Exxilons looking on, probably the City in the background, maybe the Root waving about, possibly Bellal somewhere in the foreground to balance the Doctor. When it came to sourcing images, however, much as I liked the classic Dalek aflame pose, I was reminded of just how tatty the prop they used was (understandable given it was about to be set alight). I wasn't happy that this headless, saggy-skirted, ball-less Dalek would look good on the cover. So I thought maybe I could patch in the skirt from a proper Dalek, even add the dome flying off. 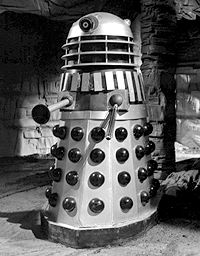 But I also knew I had a really good photo of a 'Death' Dalek courtesy of the Radio Times Story Guide that was big and high resolution and would be a shame not to use. Sure it was in black and white, but with the Dalek colour scheme for this story that wasn't much of an issue. It was then I got adventurous. 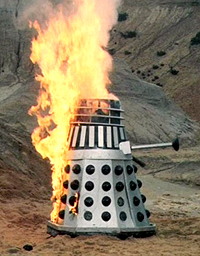 If I was going to replace so much of the Dalek in the burning photo that I would essentially just be keeping the flames, I might as well start with a decent Dalek and set fire to him myself! I wanted to keep the gist of the fire being at the back, so figured much of it could simply be painted in behind the Dalek. But there was scope with the slats and neck to add some interactive destruction. I quickly realised that just detaching and rotating the dome wouldn't be convincing, though, so found another Dalek photo taken from a higher angle to provide a head that looked more realistically tipping forward. The next step was to clean up the intact Dalek (sans dome) and give him some general colour so it wasn't totally monochrome. It was at this point I noticed this shot was actually of the static prop created for 'Planet of the Daleks' (see the fabulous Dalek 6388 site) as it was missing the oval between its arms and the two-tone base, so I painted these in. I decided it would be easier to work on the explosion effects with the Dalek in situ against the final background, so I could gauge the required colour and opacity of the flames better. The DVD provided all the images I needed: from the photo gallery, two groups of Exxilons and sand for the foreground from a photo of Jill with the dead Railton; and right at the very end of the studio footage, a handy unobstructed shot of the City model. These I cleaned up, colour balanced, sharpened and composited against a stock sky image. It was then time to blow up a Dalek! First I decided what parts would be coming apart. Obviously the head would be loose, but I didn't want to move it too far out of position and lose the overall Dalek shape too much. I broke up the bottom edge a little, although this was obscured by flames in the end, and thought it'd be fun to have one of his lights blown away. I broke off a section of neck ring by duplicating a portion and distorting it slightly, then painting out that part in the main image. For the slats coming away I painted out the rearmost couple, then duplicated and repositioned one of the forward full-length ones. I found a photo of some suitable mesh and warped this to look like it was coming away from the upper waist. (I later used the same mesh, replicated into a bigger section, to use on the neck so I could have fire showing through from behind it.) I distorted the back edge of the lower waist band, and decided to have the top of a skirt section peeling away, mainly so I could have a couple of balls flying off in tribute to the genuinely blown-up prop. Once all these areas of damage were painted in, it was time to go to work with the fire. This was mostly done with brushes: a series of flame ones I downloaded yonks ago, plus some sparks and bits of debris I created myself. I'm not an expert with brushes by any means, but they are incredibly powerful one you get some experience with how they can be varied and scattered. The lighting on the original Dalek photo perhaps doesn't totally fit with being exploded from behind, although I feel it works, with the shadow of the gun and the darker area front left not too inconsistent with the flames back right. I added some yellow light to the sand immediately behind the Dalek, but decided against having it fall on the Exxilons as it looked odd given their apparent distance. After dropping in the Doctor, I did toy with another figure across from him in the bottom right corner. Galloway would have been nice, but I had no decent photo of him, and Bellal was okay but I was reluctant because he's not a bad guy. In the end I decided another figure drew too much attention from the Dalek and that actually the title worked better there, rather than covering up much of the City as when I originally had it top right. All in all I'm rather pleased with the final illustration, especially the Dalek, for me having resonances of both the VHS and Target covers, and being one of my most ambitious compositions since the boat on 'The Romans'.